Crystal clear containers for powdered (mica) pigments. These polystyrene containers are great for packaging powdered (mica) pigments. Let the colors of your pigments shine through these crystal clear containers. 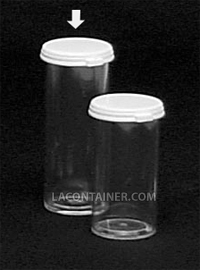 The straight wall design of these containers works well with transparent labels or vinyl decals. The tabbed white polyethylene snap cap is easy to open, however it creates a seal when closed properly. Note: Vials are shipped with caps attached unless requested otherwise. 24.9mm Dia. X 66.7mm Ht. 1.0" Dia. X 2 5/8" Ht.